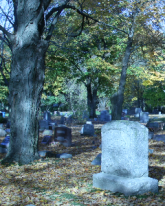 The township is responsible for selling grave burial rights, keeping records of burials, and maintaining the cemeteries. Maintenance is easier when people are aware of and follow the rules, which are designed to keep the cemetery neat and clean in appearance, and to allow for efficient lawn mowing, trimming, and leaf and snow removal. If you have any questions or concerns about the cemeteries, please feel free to contact the Township office, (616) 887-8863. Here are spreadsheet renderings listing the cemetery grave site burials by name and other data. 1) There must be a finished grave surface of grass. 2) Dwarf shrubs, small plants, urns, or other appropriate ornamental accessories must be in line with the headstone and must be within the burial space boundaries. 3) Maintenance of dwarf shrubs, small plants, urns or other appropriate ornamental accessories will be the responsibility of the family of the interred and will not be included in perpetual care, and any of such that are not properly maintained shall be removed by the sexton. 4) No wooden boxes are permitted. The minimum acceptable container will be cement. 5) No glass containers are permitted in a cemetery. 6) No decorative or loose stones, including field stone, shall be placed around the headstone or flower beds. 7) No fences of any kind are permitted on or near grave sites. 8) Flowers and other ornamentals shall be removed from the cemeteries by October 1 each year. 9) All use of the burial space or grave must be in conformance with Ordinances of Sparta Township. 10) Sparta Township and its successor reserve the right to set any and all rules and/or requirements concerning the use and/or maintenance of the cemetery and the burial space or grave that they deem proper.